Part of my job as marketing manager at Formula is to make numerous trips throughout the year to venues-performance trials, evaluations, photo shoots and our annual dealer meeting-where it’s imperative not only for our boats to perform at their best, but also to leave a lasting impression in appearance. This requires paying attention to every area of the boat, both inside and out. Marine publications give the boat a thorough once-over, so we’re very particular about our Formulas being in pristine condition. Experience has taught us that supplying the boat with the proper equipment, cleaning and otherwise, is paramount in showing off the famous fit and finish that is expected of a Formula. While it’s important to have the proper cleaning tools, it is impractical to travel with the equivalent of a fully-stocked boathouse. 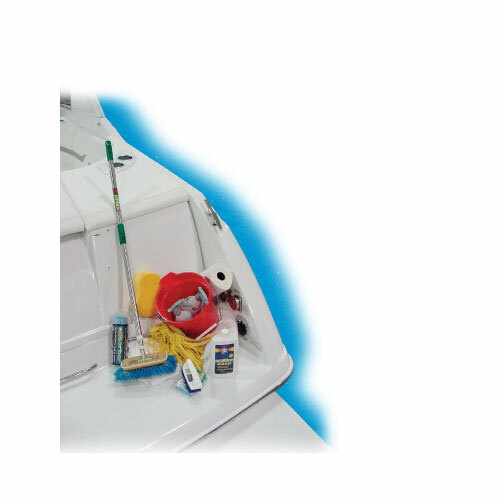 Therefore, our staff has developed a list of items we pack into our boats for our own cleaning and upkeep. I present to you the Formula “bare-bones” kit for cleaning and maintenance. Inevitably, even on a brand-new boat, you’re going to get it dirty. Just getting in and out, running it and getting it ready will cause handprints on the windshield, smudges on the vinyl, dirt on the cockpit sole and so on. If the boat’s just come back from a run, a good bath is the first order of business. That’s when your hose and nozzle come in handy. 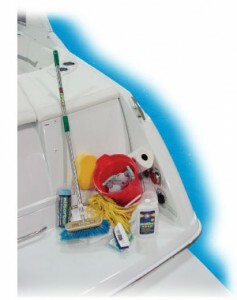 Depending on the boat’s exterior condition, sometimes a good spray-down will suffice, but if it’s really dirty or salty, we use a quality boat brush with quick-disconnects for various cleaning components, spray the boat down and go at it with Boat Zoap™ (mixed with water in the bucket you can use later to store all the cleaning supplies). Lather down the exterior with the brush and the cockpit (your Formula is self-bailing, after all) with a sponge and rinse. Snap a chamois mop head on the brush shaft, and you’ll notice it takes most of the water off quickly. Follow up with a chamois rag -either natural or synthetic-to remove the remaining moisture. Glass cleaner does the job nicely on instrument gauges and windshield water spots and smudges, and of course, paper towels. For stubborn dirt, we’re never without Krazy Clean™, a cleaning agent we’ve discovered to be surprisingly effective. If there are any stubborn spots in the non-skid, zap it with the Krazy Clean and scrub with a stiff-bristled hand brush. Finally, always have a bottle of bilge cleaner available, because no matter how careful you are topping off fluids, there may sometimes be a puddle or drip on that nice clean engine room floor. With these supplies, you’ll always be ready to impress at a moment’s notice. 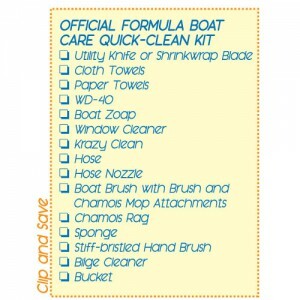 It’s a perfect kit, too, for weekend outings or quick clean-ups at the dock. Put together a kit of your own, and you’ll be able to make your Formula sparkle! If you have any other ideas for stocking your cleaning kit, contact us to let us know! Attach a picture of you using it, and you might appear in a future Boat Care column!